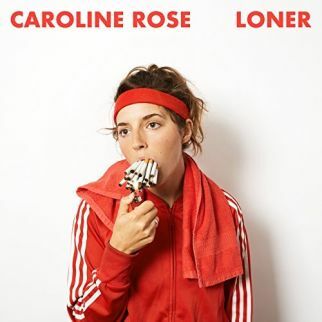 Stand-up comedy gets a soundtrack in Loner, the recent release from Caroline Rose. Each is a vignette with its own stage set and musical backing, Caroline Rose telling the tales with a smile, the stories staging mood swings against a laugh and a beat. Routine is viewed in kaleidoscopic swirls of rhythms as Caroline Rose moves through trends and trendies in “More of the Same”, skittering production and staccato keyboard taps is the foundation for “Jeannie Becomes a Mom”, snaggly guitar lines and pounding beats count time for “Money”, and chopped chords carve a path through a handclap groove in “Animal”. Obsession in the central figure that walks through Loner as the songs spend three to four minutes preoccupied with accidental pregnancy, an unfaithful lover, the wide gaps between the have’s and have-not’s, misogyny, loneliness, and death. Caroline Rose sings a lyrical spit on the carnival-ride keyboard and punk-rock bumps of “Soul No. 5” as she spins on an electronic pulse for “Cry!” and plucked notes define the rhythms for “Getting to Me” while Loner promises worldwide fame with “Bikini” and drifts on airy sonics over the punishing beat hammering underneath “To Die Today”.